@haroldmunro Looking forward to that discussion. At that point I will be in my 70’s But so relevant for my daughters and their generation! City Centre has already seen the addition of the new central library, the ‘youth park’ and the rec centre. City Hall will open there in …. and the continued expansion of SFU and the development of more urban housing means a city that was for so long a loose agglomeration of communities will have something of a centre. Most intriguingly, the development of the community plaza presents Surrey with the opportunity to orient itself in much the same way a European market town does. The build-out of Surrey in the next decade will be astounding, changing the shape of what the city is. 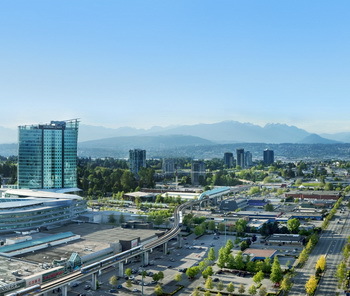 The hub structure of the Lower Mainland has for so long centred on Downtown Vancouver – adding a hub centred on Downtown Surrey will shift this structure dramatically. The hoped-for LRT system would add to this hub effect. It would serve as a unifying force for a city that already has an interesting diversity of pockets. When Vancouver was sprawling out from the downtown peninsula towards Point Grey and the Fraser, one of the keys to the city’s long term sustainability was the preservation of what some call the ‘British High Street’ model- the sort of localized nodes that have allowed for small businesses to thrive in places like Kerrisdale, Commercial Drive and Little Mountain. Surrey is well-placed to meet the changing population of the Lower Mainland. Current trends are seeing many young, middle class families move out of Vancouver, not in search of the white picket fence, but simply in search of housing affordability. One of the main drivers to the development of City Centre must be providing for these young professionals. Make sure that Downtown Surrey is a place where professionals can work. Save them from the suburban commute. I can definitely see the city parkway becoming our “High Street” by the time 2035 rolls by.